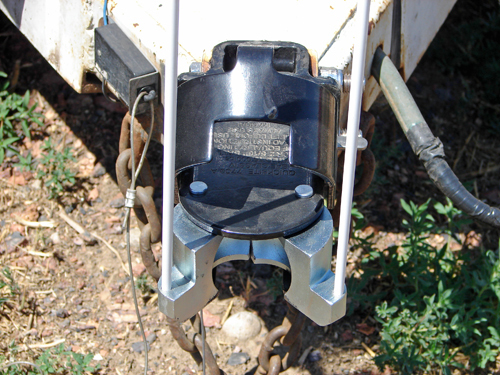 A hitch coupler that gets me excited ! I use mine each week and it tickles me after I back up to my trailer, hear the click and run back there and Walla, it’s latched, first time! 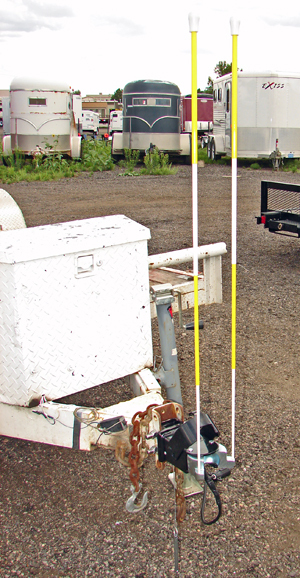 No more in and out of your truck to see how close you are to the trailer or if you’re centered and you know how much fun it is asking for help to back up. Quickbite Couplers hook up like a semi- tractor 5th-wheel. 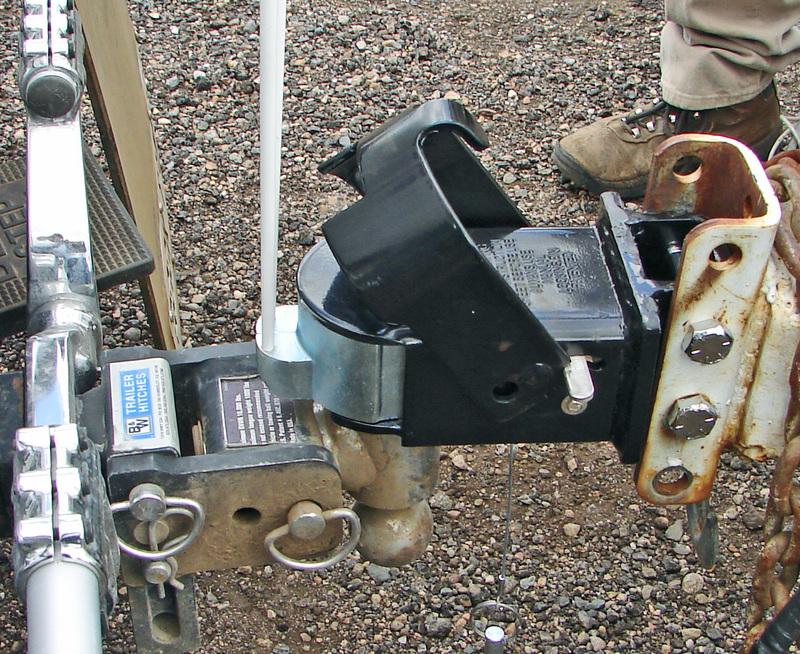 The ball funnels into the coupler and latches. A whole lot less cranking on your trailer jack. To hook up all you do is back up to your trailer and and listen for the snap and you’re hooked. I go to SEMA (Specialty Equipment Marketing Association) convention each year to see the new stuff. I found Quickbite there last year. 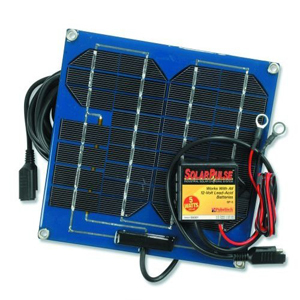 Every year someone thinks they’ve saved the world with another V-shaped device at SEMA that fits around the trailer ball on your truck. Those don’t fit all the couplers. Quickbite has a coupler that guides the ball into itself and latches itself too! All you do is put the additional safety pin in. 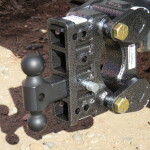 Quickbite has a coupler that guides the ball into itself and latches itself too. 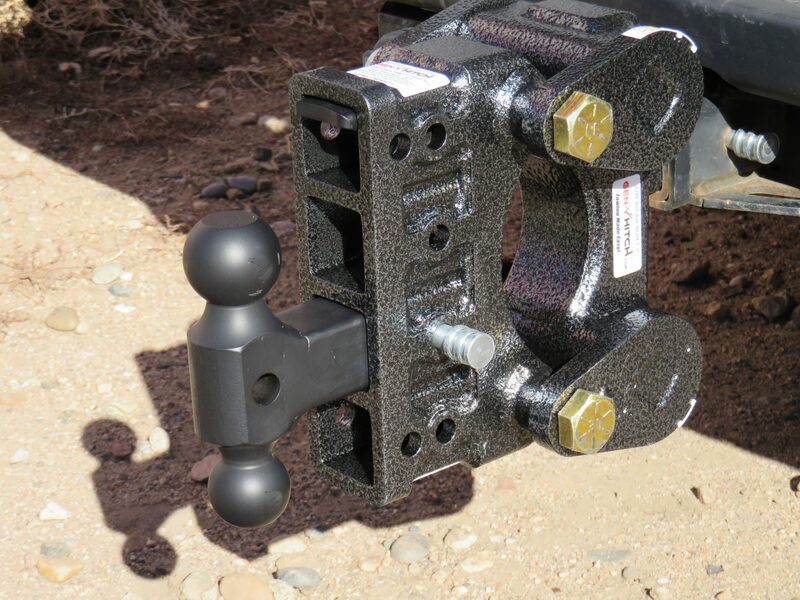 When the Dual Jaws automatically close around the ball, they are captured by a torsion spring locking jaw that drops down, locks and surrounds the internal jaws, making it all but impossible for the ball to escape. 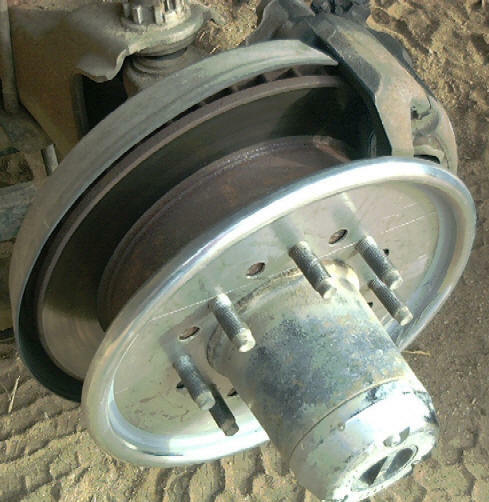 There is no need to check if the rear tab is locked under the ball like in the cheap stamped RV coupler. Many times trailers have become disconnected when, they were never locked on. With the Quickbite Automatic Safety Coupler, if it’s closed, it’s locked. 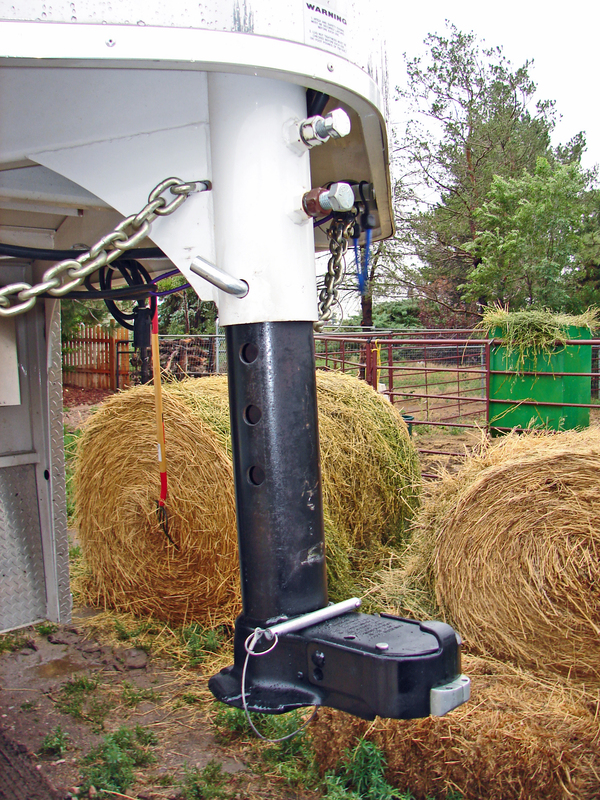 The coupler utilizes a 5″ horizontal and increased vertical funnel for the ball mount. 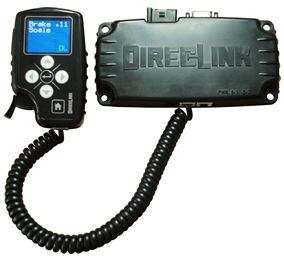 There is no need to have the coupler vertically or horizontally lined up with the ball. 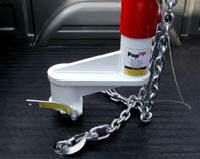 When most of the ball is within the funnel, it slides into the internal jaws which then automatically close and lock. The system is also able to couple at extreme vertical and horizontal angles.This is a coupler worth replacing what you have now. 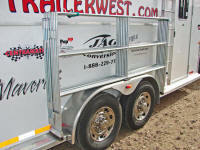 One of the more difficult things about trailering is backing up to your trailer. 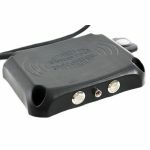 I hook and unhook often and am replacing all my couplers with QuickBite. It appeals to my lazy side. I have put allot of miles on my drivers side door hinges, going in and out to see how close I am to the ball. My trailers are heavier now too and I can’t just kick the trailer tongue over to the ball anymore.And then there’s the safety concerns. 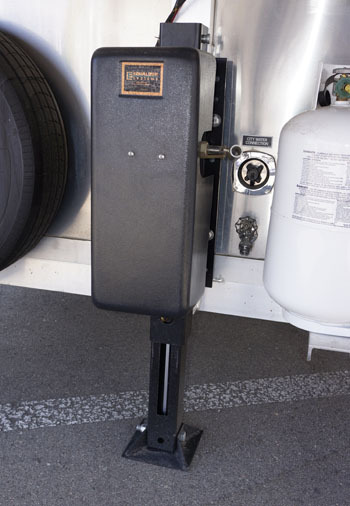 Especially in the RV trailers, the cheap stamped couplers on so many travel trailers don’t give you piece mind if they are latched or not. QuickBite Couplers snap shut, lock with a spring loaded lever and have a safety pin for the double lock like I do with motel doors. 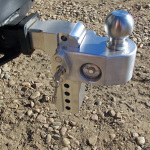 Watch Quickbite Video, and see the hitch coupler that gets me excited ! I use mine each week and it tickles me after I back up to my trailer, hear the click and run back there and Walla, it’s latched, first time! 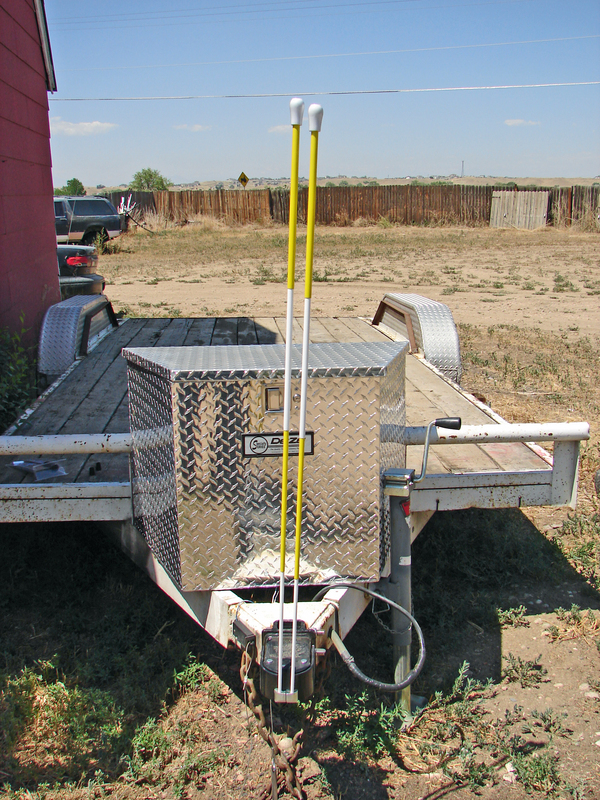 No more in and out of your truck to see how close you are to the trailer or if you’re centered and you know how much fun it is asking for help to back up. 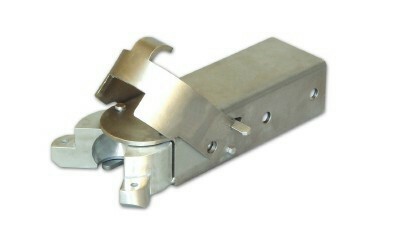 Automatic Dual Jaw Locking System surrounds the ball to form the coupler with the stainless steel jaws. 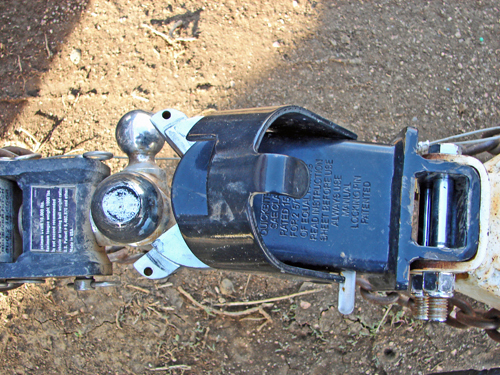 (picture left with coupler upside down) QuickBite Coupler also tether a 1/2″ secondary locking pin (picture right) for added safety and optional anti theft Locking Safety Pin. I’ve seen different trailer hitching helpers. Magnets, suction cups, camera’s, mirrors, lights. This is the KISS system, keep it simple stupi…..and it comes free with the QuickBite Coupler. 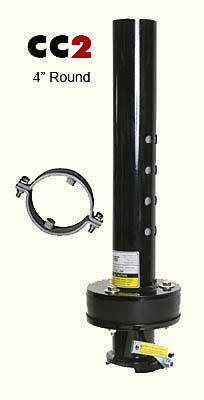 Two fiberglass rods telescope up above your tailgate or rear hatch on a SUV. You see where to back up to the rods and watch the alignment rods come together as QuickBite latches itself ! So simple and easy. 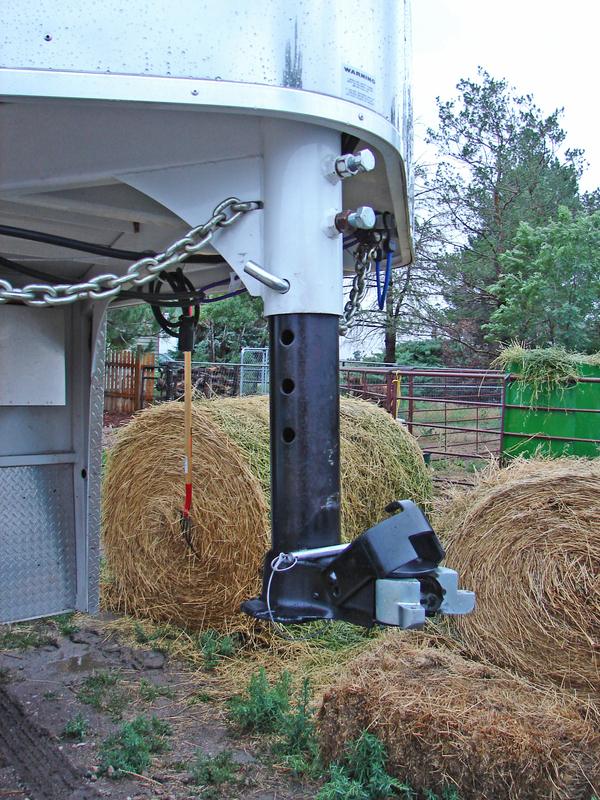 Backing up to your trailer, the rods show you where When your QuickBite Couplers self latches, the alignment rods come together, it’s so cool to go back and see the coupler latched. 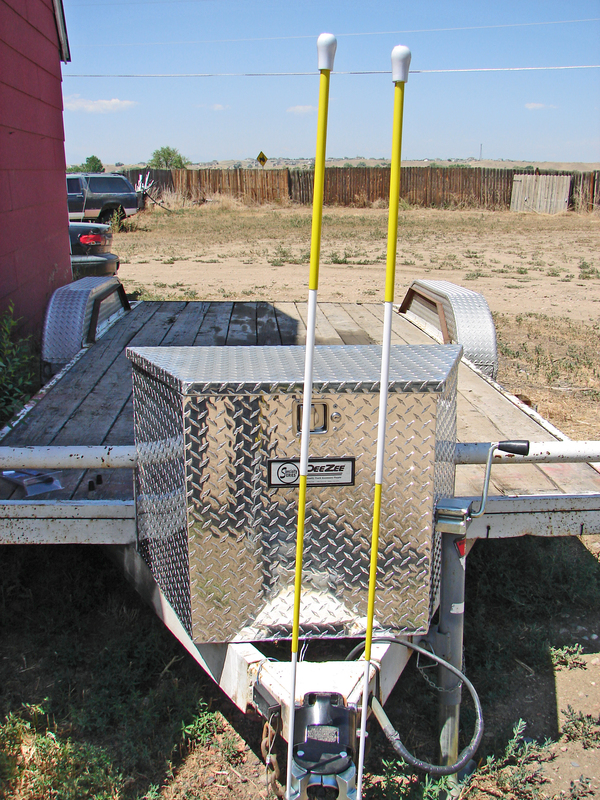 Then just raise the jack, plug in the wire and chains Quick and easy, putting up the rods I don’t use the rods anymore because I do use my trailers every week and can hit the trailer first time with QuickBite, but use the rods when you need them. 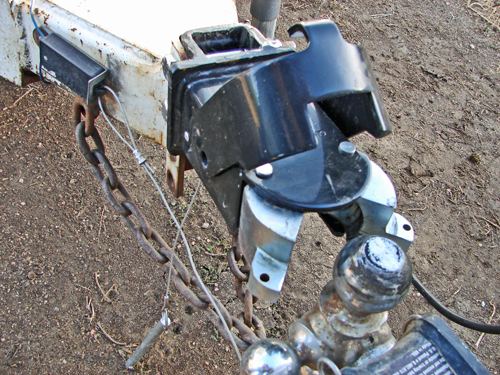 QuickBite Locking Safety Pin with polyshield, to secure your trailer, replaces safety pin. I was so excited about Quick Bite Coupler that I adapted one for my gooseneck. Maybe I can talk them into building one for you.